In July 1926, Mary Pickford and Douglas Fairbanks visited Moscow. Taking advantage of this important and curious social film anecdote for the Bolshevists, Herr Sergei Komarov ( Herr Kuleshov's disciple and an actor and sometimes, director ) filmed them in different locations and later used this footage to make a full-length silent comedy unbeknownst to those Amerikan stars. There are many interesting aspects to this film that make it unique; the first one is that the obvious Amerikan influence is not only restricted to Douglas Fairbanks and Mary Pickford appearances because the Amerikanization affects too the classical film narrative concept of the oeuvre, that is to say, a classical film comedy starring a clumsy hero who will have to perform many difficult tasks in order to gain the affection of his beloved. And typical of this type of work there are many stunts, pratfalls and hilarious mimics that reminded this German count of Herr Charlie Chaplin work.
) This is extraordinary given that films made in that country in those early times always had political references of one kind or another ( Praise for the Party, scorn for bourgeoisie and denunciations of the corrupt capitalist world ). Those subjects were inevitably a main part of the story often to the detriment of the film. 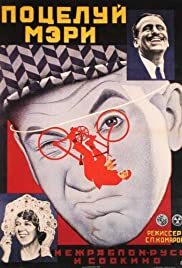 "Potseluy Meri Pikford" is a "rara avis" in the Russian silent film cinema for its lack of politics and special film achievements as well as being a funny, harmless and classic comedy, perfectly accessible on both sides of the iron curtain. And now, if you'll allow me, I must temporarily take my leave because this German Count must give a chaste kiss to one of his Teutonic heiresses.